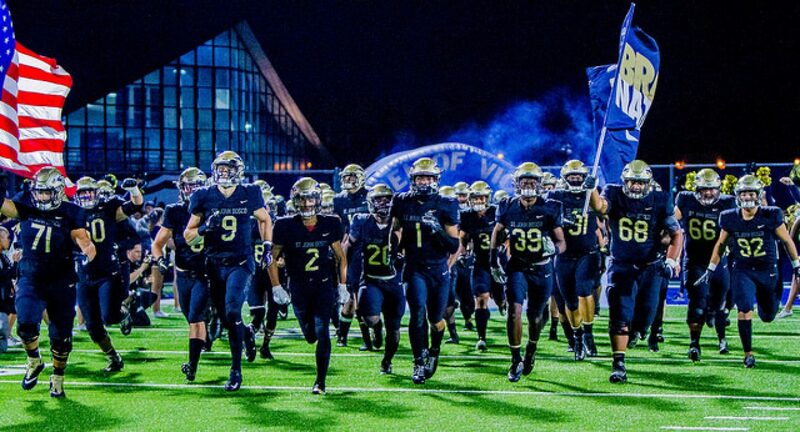 The number one ranked St. John Bosco Braves remained undefeated and continued their state and national championship journey with a 56-6 victory over San Clemente High School last night. The San Clemente Tritons came into Friday’s CIF Division 1 Quarterfinal matchup against the Braves winners of six straight and South Coast League champions. However, they were no match for the best high school football team in the nation. The Braves put on an absolute show on the defensive side of the ball, with recent All-American commits and cornerbacks Trent McDuffie and Chris Steele leading the way. McDuffie was a monster in all three phases of the game, scoring on both a punt return touchdown and rushing touchdown. He also forced (and recovered) a fumble and came up with an interception. Steele also had an interception and locked down every wide receiver the Tritons lined up against him for 48 minutes. Bosco started slow offensively, with quarterback DJ Uiagalelei throwing just his fourth interception of the season on the Braves first drive of the game. However, DJ and the rest of the offense couldn’t be stopped the rest of the way, as the five-star junior finished the game 6-9 for 245 (!!!) yards and three long touchdown plays. Jode McDuffie also had a punt return touchdown for the Braves on the night, as both brothers flashed their extreme talent on special teams. Colby Bowman, Kris Hutson, George Holani, and Matt Colombo all scored offensively for the Braves in the blowout victory. San Clemente quarterback Brandon Costello – an Oklahoma State commit – was under duress all night. Sua’ava Poti and Cole Aubrey both came up with sacks for the Braves in a dominating effort on the defensive side of the ball. These kinds of shutdown performances from the defense are extremely important to Bosco’s success for the rest of the postseason, especially against high-powered offenses that the Braves may face in remaining games. The Braves advance to the semifinals and will take on the winner of league rival JSerra and Oaks Christian, a game that will be played tonight. Mater Dei and Centennial will face off in the other semifinal game next week, so a rematch with the Monarchs is still possible in the championship for the Braves.